Imperative Music Agency Compilation: CRADLE OF FILTH, hot news !!! 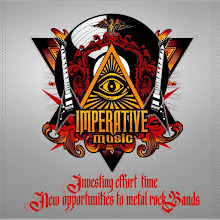 We received permission from CRADLE OF FILTH and Nuclear Blast Records to present a song from CRADLE OF FILTH's new album on the Imperative Music Compilation Vol. 15! Imperative Music proudly presents CRADLE OF FILTH [England] The most famous Gothic Black Metal Band, released by NUCLEAR BLAST RECORDS! UK's legendary extreme metal icons Cradle of Filth have released their brand new album, ‘Cryptoriana - The Seductiveness of Decay’! Out Worldwide by NUCLEAR BLAST RECORDS !!!!! The twelfth studio album from the UK's most visionary and hellish outfit! IMPERATIVE MUSIC COMPILATION DVD VOLUME 15 will be, no doubt, the most daring volume of the series to be released by Imperative Music including big names such as Cradle of Filth (UK), Destruction (Germany), Death (U.S.) and HammerFall (Sweden). Enrich Discography and Biography of your band to mention that one day, your band had the same disclosure alongside great bands, Record-Labels always find this interesting in the "world recognition factor" and take into account as a good reason to sign his band, besides of course the musical quality. Top Deluxe Compilation with Worldwide Distribution! Introducing the Best Metal Bands today!!! The only Compilation sent directly to Metal Rock fans and customers of Extreme Music around the world, supported by serious and professional Distributors, Retailers, Stores and Mail-order services. The Compilations is not sold to the public, the people receives as a free gift. Join us! New Bands, unsigned Bands are welcome to participate with a small contribution, absolutely the bands will be promoted in Europe, United States, Brazil and Japan.